Experience true Brooklyn style loft living in Milwaukee’s hip Fifth Ward/Walker’s Point neighborhood. Each loft has been custom designed to incorporate concrete floors, exposed high ceilings, massive wall to wall factory windows, and designer kitchens with large islands. Along with it’s one of a kind architectural style, the Junior House Lofts also consists of a built in history. What was once a successful, trend setting clothing manufacturing company in the late 1950’s early 1960’s, is now being restored into a trend setting apartment building. The large dramatic factory windows and industrial chic atmosphere, keep the buildings fashionable history alive. 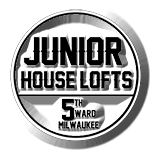 Junior House Lofts combines luxurious loft finishes, fantastic amenities, a superior Fifth Ward/Walker’s Point location, and an excellent property management team making it one of the most desirable apartment communities in Milwaukee. Each of our loft apartments have been carefully appointed with the best in finishes and conveniences catering to the needs of our urban residents.